Model C-HO, Jumbo Steel String Guitar from NK Forster Guitars. I ordered this guitar specifically for playing Celtic finger-style in DADGAD tuning and its intonation is superb. Also, for the same reason, I ordered a 650mm scale length. The design of the guitar means it has a 'cylinder' Italian spruce top and double sides (you can read about this on his website: www.nkforsterguitars.com/instruments/handmade-acoustic-guitar-model-c/ ).This design is supposed to produce a very clear, resonant sound. Does it work? Absolutely, unequivocally YES. 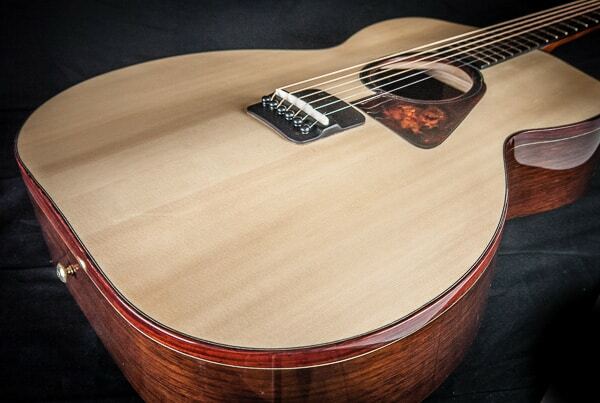 The sound this guitar produces is as clear and resonant as a bell. The sustain is incredible. The lovely thing about this instrument is how versatile the dynamics are - if you want to play loud and clear, that's what you get; if you want quiet and warm then that's there too. The workmanship and finish is up there with some of the best. 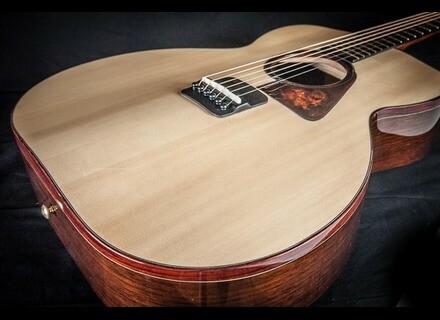 If you want a guitar with fancy inlay work then you probably won't want a Forster. Nigel goes for a quiet, understated appearance and his guitars are probably bought because of how they sound.